Democratic incumbent Sen. Mary Landrieu no longer talks about her clout in Washington. She’s only concerned about timesheets. During the final Louisiana Senate debate Monday evening, Landrieu pinned her hopes on maintaining her seat by trying to cast doubt on Cassidy’s part-time work as a doctor at LSU. 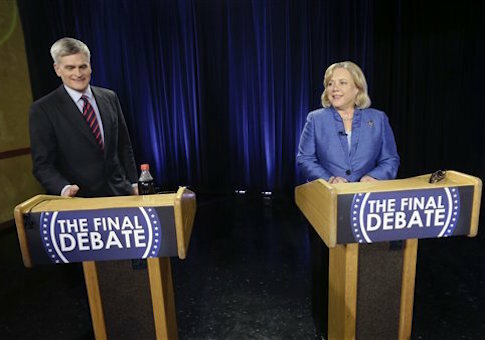 The debate in Baton Rogue was Landrieu’s last attempt to hang onto the seat she has held for 18 years, as she faces a double-digit deficit to her Republican opponent ahead of the runoff election on Dec. 6. Cassidy, a gastroenterologist, served patients at the University’s Health Sciences Center as a clinical resident supervisor for five years while he was a congressman, earning roughly $20,000 per year. Landrieu’s campaign now alleges that he did not properly record his time, and was in Washington on days he claimed to be working for the hospital. Landrieu called Cassidy’s missing timesheets a "much more serious matter" than her illegal use of more than $34,000 of taxpayer funding for charter flights to attend campaign events. "He is not a doctor for the poor," Landrieu said. "He’s a doctor for himself." Cassidy said the charges are "absolutely false," and that he would often conduct a liver biopsy in Baton Rouge, before flying to Washington, D.C., for votes. Cassidy also said he would teach medical students on residency in the D.C. area. His former supervisor, Dr. George Karam, defended Cassidy and said LSU got "much more than we paid for." "When you work with them during the day and you meet with them in the evenings beyond hours, there's no place for that to go," Dr. Karam said. "There's no way to reflect that on a time sheet." "If what I was doing benefited the poor and the uninsured, who did Sen. Landrieu—when she used those taxpayer dollars for private charter jets to her campaign events—who did that benefit?" Cassidy said. The debate moderator also questioned Landrieu on her charter flight expenses, which included a $5,500 bill charged to taxpayers for a flight from New Orleans to Lake Charles, roughly 200 miles. "If that had happened in the business world I think at most business people would have been laughed out of the room if they suggested having that kind of expense charged to a company," the moderator said. Landrieu brought along records regarding the charter flights, which the moderator dismissed as a "prop." The Democrat continued to bring up Cassidy’s LSU work throughout the debate, asking him directly about the timesheets, which he again dismissed and defended his time there as serving the poor and uninsured. When Cassidy got his opportunity, he questioned Landrieu directly about Obamacare architect Jonathan Gruber’s recently revealed comments that the "stupidity of the American voter" allowed the law to be passed. "Did you know that Mr. Gruber and the Obama administration had written this to deceive the American people, and now that you do know it would you vote for Obamacare again tomorrow?" Cassidy asked. Landrieu avoided answering the question directly, saying only, "I don't read what Jonathan Gruber says." "I don't even talk to Jonathan Gruber," she said. "I talk to my constituents." Landrieu again defended the president’s health care law, saying Obamacare is not perfect, needs to be fixed, but "for some people it’s working very well." This entry was posted in Politics and tagged 2014 Election, Bill Cassidy, Mary Landrieu. Bookmark the permalink.